Maximizing Progress: Sperm Bullitt ~ Brilliant Bicycle Delivery Service! 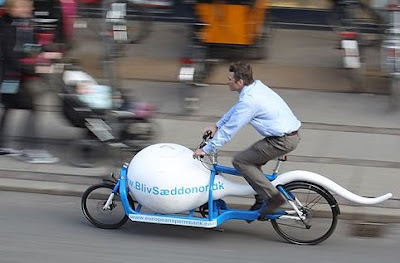 Sperm Bullitt ~ Brilliant Bicycle Delivery Service! Thanks to Copenhagenize.com for spotting the Sperm Bullitt! "Just when you thought you had seen everything in the Copenhagen bicycle culture, the Sperm Bullitt appears on the cycle tracks of the city. Yes. The Sperm Bullitt. This is brilliant. If you're cycling around Copenhagen, keep your eyes peeled for this bike. 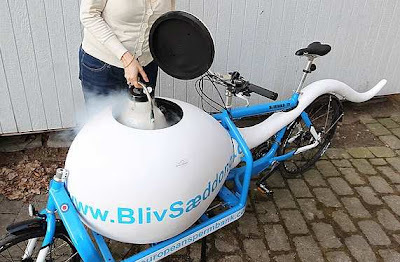 Nordisk Cryobank (European Sperm Bank) is one of Europe's leading sperm banks and the company was looking at environmentally-friendly alternatives to how they could transport their sperm samples to the fertility clinics around Greater Copenhagen."